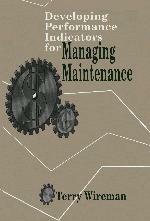 This book presents a unique, detailed, and much-needed "road map" on how to measure and then improve one of the most important functions in today's modern organization: equipment and asset maintenance management. The author presents an overview of what constitutes maintenance, how it is developed or evolved, and, finally, the performance measures that can be used to effectively manage maintenance. Enables managers to maximize their investment in the maintenance function and ultimately their company's assets by helping them focus on specific indicators. Connects typical functional maintenance indicators to a company's strategic indicators. Shows how to improve low-performing indicators. Contains a detailed table of contents that helps readers quickly find specific indicators. Includes a glossary of maintenance terms that provides a useful ready reference. The Maintenance Function. Developing Maintenance Functions. Preventive Maintenance. Stores and Procurement. Work Flow Systems. CMMS. Technical and Interpersonal Training. Operations Involvement. Predictive Maintenance. Reliability Centered Maintenance. Total Productive Maintenance. Statistical Financial Optimization. Continuous Improvement. The Performance Indicator Hierarchy; Corporate Performance Indicators; Financial Performance Indicators; Efficiency and Effectiveness Performance Indicators; Tactical Performance Indicators; Functional Performance Indicators. The Future.